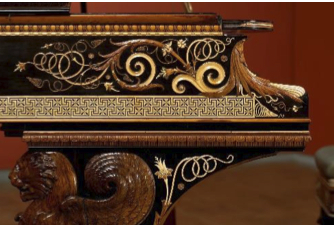 For well over a decade, I have observed the splendor of the decorative piano at the Clark Art Institute. Admittedly, I had not taken a serious look at the details until last week. As resurgent interest in Sir Lawrence Alma-Tadema (British, born Netherlands 1836–1912) raises appreciation and interest in his work for a new generation, the Clark offers new insight into one of the painter’s most successful and distinctive artistic endeavors—the design of a music room for the New York mansion of financier, art collector, and philanthropist Henry Gurdon Marquand (1819–1902). Orchestrating Elegance: Alma-Tadema and Design reunites 12 pieces from the original furniture suite, along with paintings, ceramics, textiles, and sculpture from the room for the first time since Marquand’s estate was auctioned in 1903. The Clark’s ornately decorated Steinway piano, acquired in 1997, is the centerpiece of the exhibit which runs through September 7, 2017. The music room acted as the Marquand mansion’s parlor and formed the social center of the residence. 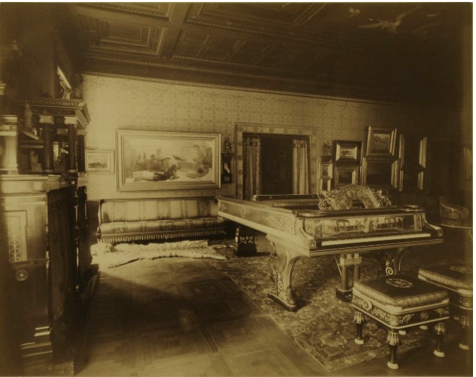 Marquand set no cost limit for the music room project, which was Alma-Tadema’s only commission of this type. The resulting furniture suite, extraordinary in every detail, created a sensation when it was displayed in London prior to shipment to New York. Acclaimed for its imaginative forms, the suite was painstakingly decorated with veneers of ebony and cedar accented with elaborately carved inlays of boxwood, ivory, abalone, and mother-of-pearl. Magazines and newspapers on both sides of the Atlantic featured extensive coverage of the furniture and the room, praising the design and craftsmanship, while marveling at the cost: an estimated $50,000 for the piano alone. The piano has a rich history as a musical instrument. Its interior lid was fitted with parchment sheets so it could be signed by the musicians who played it. Over the years, a number of famous musicians signed it, including Walter Damrosch, Sir Arthur Sullivan, Sir William S. Gilbert, and Richard Rogers. The exhibition includes a room devoted to the musical history of the piano, featuring a video of the recent performances on the piano including music tied to its history. The Clark galleries are open Tuesday through Sunday, 10 am to 5 pm. For more information, visit www.clarkart.edu or call 413 458 2303.